This comment was posted to reddit on Apr 15, 2019 at 5:58 pm and was deleted within 5 minutes. 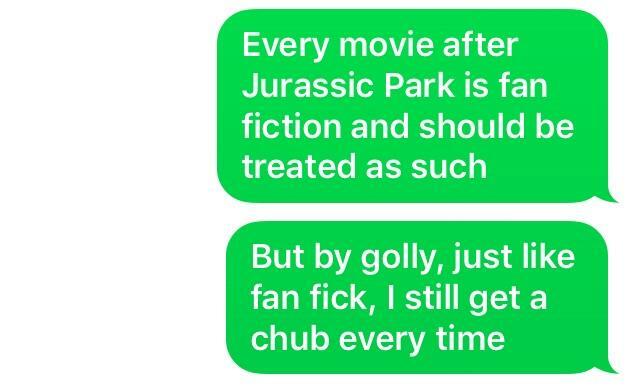 One of the main problems of this Jurassic World franchise is that they have taken away the sense of adventure and magic that made us fall in love with the first films. Okay, I understand that it's hard to treat as if seeing a dinosaur was something magical after so many movies. But going to that side of action scenes with silly humor is pretty crude and a lack of respect for our intelligence. Now that the dust has gone down I see more and more negative comments about the movies, which is fair. What I find most sad is that they could have gone towards a horror movie, like it was made in the Lost World, not this childish terror of the Jurassic World Fallen Kingdom. Maybe even films exploring this ethical question, but in a more adult way, not summarizing in 2 lines at the end of the film. Anyway, I think the movies tried to be a lot at the same time and could not be anything. Extremely disappointed with the potential we had and at what turned out to be the pursuit of money. Quoting Malcolm: Your scientists were so preoccupied with whether they could, they did not stop to think if they should.